Or, whatever goes around, comes around (again?) I find this principle in cooking leftovers as well as in life. I have personally been reconstituted a number of times. I'm not the same person I was 10, 20 or 30 years ago. We have that option of change, not having to stay in old ruts and ways of doing things. On many a Sunday I will fix enough dinner for our extended family. However, if there has been a communication outage, and no-show, we might be left with a terrific amount of whatever it happens to be. In this case, a lovely beef stew. Two nights, not even concurrently, of anything re-heated is probably enough for most of us. Excepting possibly bachelors. When I first met Bob, he was in the habit of cooking up a large batch of soup or stew and, voila, dinner for the next week. So, the remainder of my pot of stew was relegated to the freezer. The following week, I saw a post on Smitten Kitchen about empanadas, recipe for a meat filling in neat packages of pie crust, and the little bulb upstairs flickered into life. Yes, brilliant, no need to cook up and prepare a stuffing for those babies. It was waiting patiently in my freezer. Deb suggested that next time she would spice it up a bit. So, no problem. I can do that. This sort of dish has a relative of one type or another, boiled, baked or fried, all over the world. There are Hamburgers (should they really be included? ), Pita Pockets, Cornish Pasties, Aussie and English Meat Pies, Empanadas, Calzones, Pierogi, Samosas, even Manapua (as we call them in Hawaii). Traditional, very portable meals, they all probably originated as lunches for workers, or to take on picnics. There is a good history of them here. But, what an awesome reincarnation for some of our left-over meals. The pie crust recipe was not only basic, simple and easy to work with, it was flaky and tasty. If you do freeze some pies, put them uncooked on a baking sheet, fairly close together and set in a freezer. 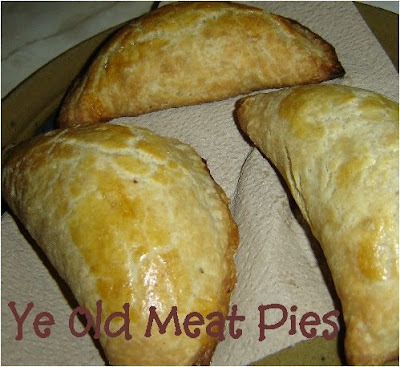 When they're totally frozen you can dump them all into a zip-lock freezer bag til you get the urge for more meat pie. A label might be a good idea, in case you forget just what is in that empanada/pie/pasty. Sift flour and salt into a large bowl and cut in the butter with a pastry blender or two knives until the mixture resembles coarse meal, with some of the bits about pea size. Beat the eggs, water and vinegar in a small bowl. Add to the flour mixture, stirring with a fork until just incorporated. Then turn out onto a floured surface and knead gently a few times to gather it all together into two flat rectangles. Chill them, wrapped in plastic for at least an hour, up to 6 hours. however, you can use the above link to Deb's site for her recipe. For my stew, I minced up the chunks of tender, slow-cooked beef and the larger pieces of carrot, potato and turnip, etc. and added in some zippy spices. Depending upon the main filling ingredient, you might add sliced olives, capers, diced hot peppers, minced salted lemon, etc. The sky is the limit here. I had a jar of Berber dry spice mix I had made up for one of my ethnic experiments, Ethiopian Teff Bread - where you put the curry like mixtures on top and tear off sections. So anyway, I added a few tablespoons of that spicy mix to my filling. I really loved the way they turned out, a very re-doable deal. The crust makes 12 and I had exactly enough to fill them nicely. Six to bake and six to freeze. When ready to roll, preheat oven to 400F. Cut one of the dough pieces (leaving the other in the fridge) into 6 equal portions. On a floured surface, roll each chunk out into a 6 inch disk, place about 3 tablespoons of filling in the center, moisten bottom half edges with water, fold over, seal, press with fork tines, and place on a baking sheet. If you are going to freeze some, place them closer together on a separate sheet and put in your freezer. Happy Blogaversary to me, happy blogaversary to me, blah, blah, blah. From me to me. One hundred five posts later, one whole year today, of ranting, raving, recipes and misc. other stuff for all the world to see . Ha. All two of you. Or, anyone else who doesn't comment. 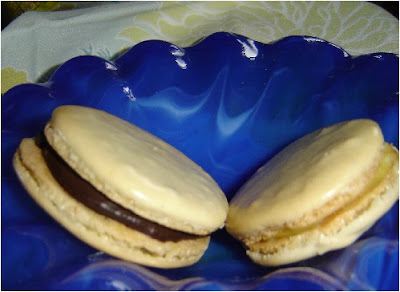 A couple of the famous macarons from food bloggerland here. I have to say, if it wasn't for the fabulous internet, and blogging, reading posts from all you foodies out there, I'd have no clue what a macaron was, much less have tried to make one, not to mention duck confit, or heard of matcha, black garlic, finger limes, ganache, beignets, etc. etc. What a world! What a year! It's certainly had its ups and downs. Kealani, my granddaughter, and I have had a great time learning more cooking techniques and trying out new recipes. Here we are making matcha shortbread cookies for St. Patrick's Day and, bottom right, yesterday's macarons (which should really have bigger feet). The only difference in the macarons from your normal, we added powdered vanilla essence and used lemon curd for one of our fillings. The other filling was a simple bittersweet chocolate ganache. And, my deep thought this morning was, we don't always have the option of changing or getting out of a particular situation, but it is possible to change our attitude, regardless of who or what or where we're stuck with. We can not only change, but grow and improve. Yes, in all areas. My regret is that I took so long to figure it out, and years of pity parties later, it's good to celebrate. My presentation usually leaves something to be desired. I'm going to work on that aspect of cooking. Oh brother, I made enough of the coulis for two dinners - what comes of following directions too closely - and could have braised up all of my watercress as it cooked down so much. 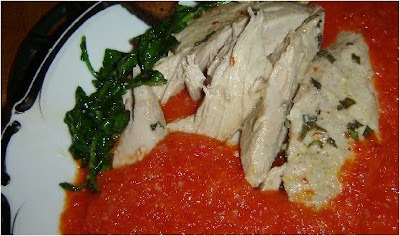 The recipe was adapted (not enough) from Sam Choy's Sauteed Onaga with Red Pepper Coulis and Braised Watercress. Especially for today we need more green in this, but the colors were brilliant anyway, and everything tasted superb together. I used ahi - Bob's favorite (and the only fish he really wants to be confronted with). The remaining coulis will be great with some Corn Fritters I'm planning to make. What started this off was beautiful, big red bell peppers in our Natural Foods Market at an unbelievably low price. Usually they're right out of sight and I'll get one at the most, once in awhile. Then, I've been wanting to make a coulis of some sort, since I figured out what the heck it was. I tried straining this one after pureeing, as instructed, but it was coming out way too thin and leaving all that nice vegetable behind, so I pushed it through a bit more, then just combined everything. I'm not a trained chef, folks, just trying stuff as we go along. I have to tell you though, it turned out fine. The vibrant red bell pepper taste really sings. Since you all most likely have your favorite way of cooking a nice fillet or two of fish, I'll just give Sam Choy's Red Pepper Coulis recipe. The watercress, cut into 1 inch segments, was simply wilted in 2 tablespoons of butter. His recipe only called for 1/2 cup of cress! I don't think that wee bit would even show up under the fish. He instructs to place the watercress in the center of the plate and put the fish on top, then decorate with the sauce. He also whipped up a Kabocha Squash Sauce to make things even more special. 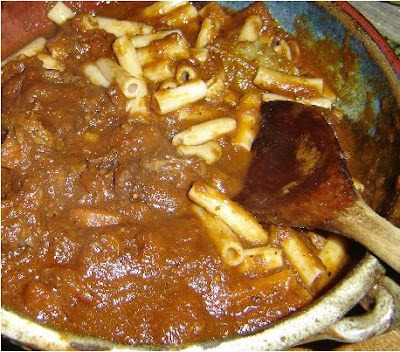 As you may have noticed, I just put the bit of green to one side and let it all swim in red sauce. I would definitely suggest using a whole bunch of watercress. And, I only used 1 1/2 peppers, though they were big ones. Still, as I said it made quite a bit. Nothing wrong with that. Split red peppers in half, remove seeds and dice. In a sauce pan, add the red peppers, shallots, 2-3 oz. wine and the vermouth, and thyme. Boil for 25 minutes. Puree and strain, and season with salt, pepper and sherry. I cooked the sherry along with the wine and vermouth. Well, this has to be some kind of record. Three recipe posts in a row. We're not food bloggers here folks, but it's about life, and guess what? Food takes place at least three times in a normal day. I do give it some thought, and enjoy cooking. Try to be creative and all. Spread the enthusiasm. Hey, even my grandson has gotten into it. He just posted on his blog about my popovers. What a kid! I would like it if the photo matched the taste, which was awesome. Slow braised, cross-cut beef shanks (a very inexpensive bit of meat) with herbs, vegetables, in wine and stock for two hours. Then, after removing the shanks, pushed everything through a strainer for a wonderful ragu sauce, with the added back bits of meat, to top polenta or pasta. I adapted my recipe from Ms. Glaze's recently posted Braised Beef Shank with Rosemary Polenta. I'm planning a polenta dinner in a few days and didn't want to repeat myself, so used the penne, which accompanied very nicely. I was also out of canned tomatoes, so a jar of marinara sauce from my pantry was a very decent substitute if I do say so. And, I do. Preheat oven to 325˚F. Make incisions into the thick connective tissue that surrounds the leg meat. Tie with kitchen string if you want to keep the meat together. Season beef shanks well with salt and pepper. Heat 2 T olive oil in a large oven proof pot, and sear the shank on all sides. Add the onions, shallots, carrots and continue to sauté until onions are softened. Pour in the red wine and reduce by half. Add enough beef stock until it just covers the meat, then add all the sauce from the can of the peeled tomatoes and 4 of the tomatoes. Break apart the tomatoes with a spoon. Or just use, as I did a jar of marinara prepared sauce; and toss in your fresh or dried herbs (if using dry, use less). When the braising liquid is simmering, place in the oven uncovered. Check every half hour and turn the shanks over after 1 hour. If the braising liquid is reducing to quickly you can either add more stock and red wine or place a lid on it. The meat should be covered on the sides at all times. After about 2 hours the meat should be tender. Remove shanks and keep warm. Put the braising liquid through a strainer pressing hard against all the vegetables with a ladle or wooden spoon. (If you lack the patience for this, just puree in your food processor or blender). Scrape the bottom of the strainer and make sure to add all those puréed vegetables. Return the resulting sauce to the pot and reduce until thick enough to coat the back of a spoon. Mine was already thick enough, even though I added stock to help get it through the strainer. Add the shanks back to the pot and keep on low heat while cooking up your pasta. 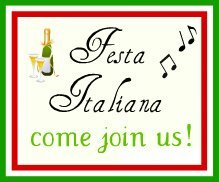 Since we're just in time for the Second "Festa Italiana", organized annually by Maryann of Finding La Dolce Vita and Marie of Proud Italian Cook, I'm going to submit this. Check it out for all kinds of delicious Italian dishes. We watched a movie (cartoon) last night, more for the kids, but the adults occasionally looked up from their Blackberry, book, or conversation too. It was Ringo Starr's old film, The Point (and it did have one, ha). So, to go with the theme of our very own, personal event, my granddaughter and I made cookies with a point. Adapting the idea from Ximena's post at Lobstersquad for a single, giant, pizzza type cookie, which you cut into wedges, with yes, a point. We made oatmeal, chocolate-chip cookies, an old standard, and they were definitely a hit in this new guise. Next time, I believe a shorter cooking time would be even better - perhaps 12-15 min.? These were crispy, yes, but not soft in the middle. I left them in the oven, and went to take a shower ( did wonder about the wisdom of that at the time). Meanwhile, Kealani was watching the timer and the clock, armed with a silicone oven mitt. So, here I am in the shower, washing my hair, and I could smell the cookies nicely baking, then that about done smell, then at the point of going to burn if you don't immediately do something, like right away . I yelled for her to take them out and was unsure if she'd heard me. It's frustrating being in the shower and trying to communicate with the outside world. She had decided there was enough time to go put the chickens in for the night. There was, by the clock and the timer. But, the sense of smell rules in a kitchen. That's the point.